pretty mauled up from the previous owner. free, and some vice grips got it moving. put it all back together with new brakes. I learned the hard way while doing brakes on a Toyota that if you put new shoes on it and the brake drum doesn't just slip on easily, do not pound it on. You will have a hell of a time getting it off. Fortunately the Toyota brake drum was small enough that I could put a big handscrew wooden clamp on it and then beat on it enough to finally get the drum off again. Good luck, I wish I could help you. Hi Fretzfarm, welcome to the forum. I didn't experience the problem when I put brakes on my 2N, but I bought brake show assemblies. It seems to me, someone else had a problem awhile back with brake linings that were too thick. Once you get it back apart, no easy trick there, I would pull the links from the adjuster and grind the inside ends down. The other option is take the brake shoes to a brake shop and have them ground down. Good luck, and let us know how it turned out. Hopefully someone will chime in with tips on how to get the brake drum off. The return spring on one of my Cushman's brakes broke and I had to pull the drum off. It was a bear to brake loose. Fortunately I kept the axle nut on, or the drum would have shot across the room. Well it's probably not going to be easy! 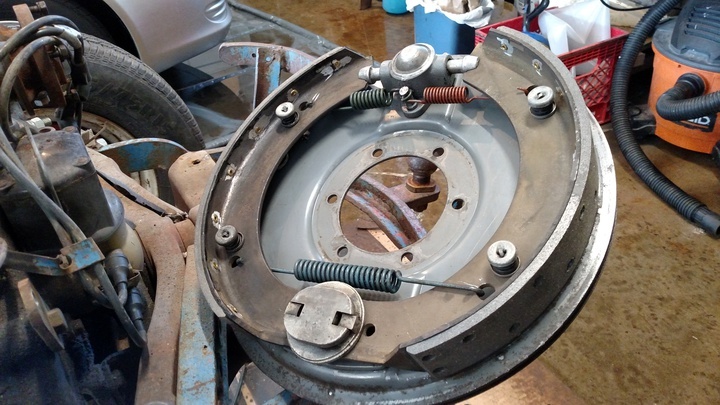 If it was the Toyota someone mentioned they generally have 2 holes in the drum that are threaded and you put bolts in those holes and the bolts push against the axle flange and push the drum off. If you can do something like that it's better as it pushing on the center of the drum. If you have a large puller, many are sold as drum pullers, it might work but pulling from the outer edges sometimes tightens it to the shoes even more. You might be able to cut the heads of the brake hold down spring pins allowing the shoes to come free from the backing plate. When you get them free you might have to find an old shop with an old brake shoe arcing grinder to trim the lining down. That's the beauty of drum brakes is they are self energizing. As they contact the drum they try to rotate and apply themselves harder, so the harder you turn the tighter they get. Thanks for the tips! Way better plan than what I was thinking; it involved welding some chain links to the brake cover assembly and 2 or 3 come-a-longs. When I put the adjuster back on after freeing it up, I used nuts/bolts in place of the the two rivets on the outer side. For the brake spring post; I just put the side I had ground back through the adjuster and the hole in the brake dust cover assembly and welded in place. I might be able to grind/drill/knock it out to get the springs to release. I'll try grinding down the inside of the two metal pieces that go into the adjuster for more clearance. If that doesn't work, I'll see if I can find someone that will grind brake pads. Thanks a ton for the advice. It does not take much friction to keep you from turning the drum by hand . You might be able to install that tire and rotate the drum , which may ease the friction . 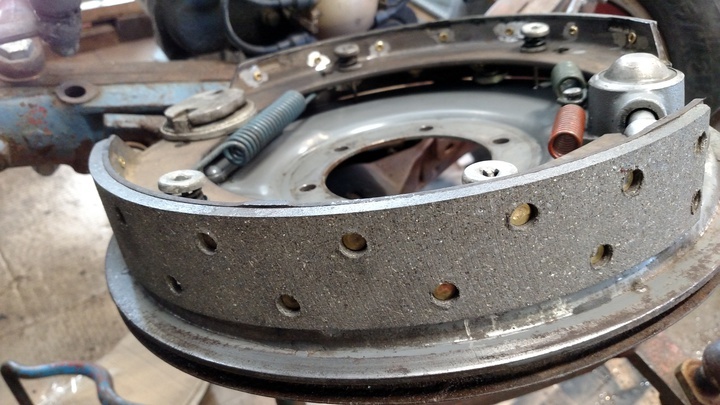 You may have an egg shape to the drum or material build up around the brake lining rivet holes . Ebay has lots of guys parting out 9N / 2N 's and those brake assemblies are slow movers so the prices are usually very low . If not there are plenty of guys here that would help you get good usable parts . Shipping is a killer these days . Wedge a large straight screw driver between the drum and the backing plate and just put a little pressure on it ,then hit the drum on the side with a hammer. Hammer all around it then move the screw driver 90deg and go again. All you are trying to do with the hammer is shake the drum and slide the shoes . The retainers have enough spring to pull the shoes back to the tractor while you pull the drum off. It will take some time. The worst thing you might do is pull the pins through the retainers.